Schaefer also provides Supported Living Services (SLS) to people who live independently or with their family members. All people in SLS can receive any of the day program services we offer. Remember, you can receive as many day services that you want as long as they fit within your plan. If you want a variety, choose our day program services! In addition to these services, we also provide several other services to help you live more independently in your community. Every person in SLS has a certain amount of money that they can use to receive the services that they need. There is a cap on these services, so it is very important for you to decide which services are the most important to you. Our mentorship services can help you with this. Read on for the SLS services we provide! If you choose to have someone assist you in learning how to make good choices and teach you various methods to improve your decision making skills, Schaefer can lend you a helping hand. Our professional staff will assist you in meeting all of your needs in this area. Some examples of the mentorship services we provide include: helping our consumers to find educational classes that they would like to take, assistance in coordinating medical and health services by helping you to understand your medical issues and what you need to do to ensure that you remain healthy. We can also help you find generic services to help meet your needs if you do not have enough money in your plan to purchase these services from an SLS provider. 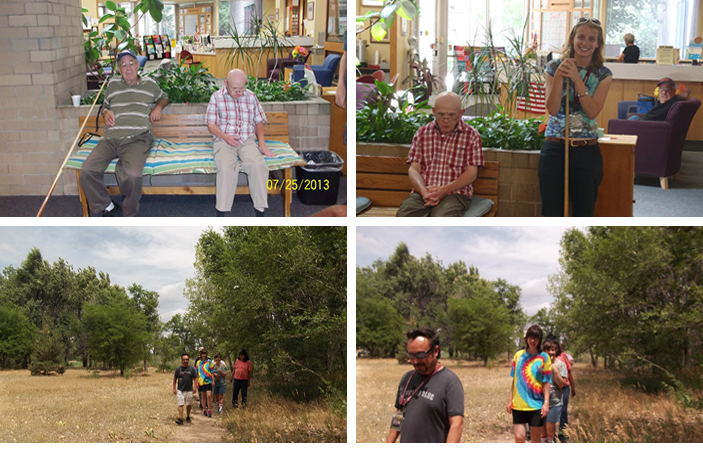 Our main community connections service is described under our day program services, however, we do have a special community connections program for people receiving SLS services. We have activities on nights and weekends so that you can learn skills to help you access your community independently. We help you participate in advocacy groups, learn how to use computers through library education as well as several other activities. We have staff who can work with you in a wide variety of areas to help you to live more independently. We also can help you with all of your medical appointments. We will schedule them for you and then take you to them to help you understand all of your health issues. We also can help you with learning how to handle your money, making budgets and teaching you to independently pay for any items you might purchase. We even help people to learn how to take care of their personal hygiene and do their laundry. Grocery shopping assistance is also available should you need that. You can choose your personal assistant and they will provide you with whatever assistance you need in this area. Our staff are checked out thoroughly before we allow them to provide your services - especially if they will be going into your home. We do background checks, licensure checks and drug testing. We also provide training to all staff before they can go out and work with you. Once they start working with you, we have our supervisors go to your home and watch the staff person providing your services. They do this to make sure that you are receiving the services you need and to make sure they are treating you with respect. You can trust that our staff will keep you safe and treat you in a positive and friendly manner! SLS allows for basic homemaker and enhanced homemaker services. Both of these services are geared to help you learn how to manage your house or learning to cook. We can come into your house and provide you assistance and training in cleaning your house or learning how to cook nutritious meals. Basic homemaker means that we will help you do all the jobs, such as cook for you or clean your house. Enhanced Homemaker means that we will provide you with formal training to help you learn to do these things so you can do them on your own in the future. It is important that you know that in order for an agency to provide services in your home, they have to have a special certification from the Department of Health. Schaefer met all criteria to receive this certification. We are a Home Care Agency through the Department of Health, so we are able to provide not only homemaker services but also personal assistance services. This is a really good thing for the people we serve because Schaefer gets two surveys to make sure that we are providing the services correctly - one from the main Division of Developmental Disabilities and one from the Department of Health. So before you choose a personal assistant or a homemaker provider, make sure that the agency is certified by the Department of Health as a Home Care Agency. Sometimes, the people you live with may have to go away due to an emergency or a business trip. If this were to happen to you, Schaefer can hire a person chosen by you and your care givers to stay with you overnight. They will help you with all of your needs while with you. They will cook your meals, help you clean up and make sure you take your medications. Most importantly, they will make sure you are safe the entire time that they are with you. If you need supervision during the day, but you don't need it for overnight, we can provide you with hourly respite (supervision) care. We will have you choose a staff member and they will provide you with supervision and care either in your home or the community. If you have special needs that are not mentioned here, please give us a call and we will help you to meet your choices and goals! We hope to see you soon! 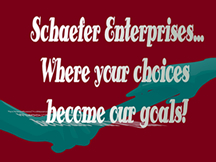 Remember at Schaefer, Your Choices Become Our Goals!